I can't tell you the last time that I made mashed potatoes. For the past two or three years I've served potato gratins for Thanksgiving and so it has been awhile. Growing up my mom was the expert on mashed potato making and my sister and I lived in fear of making lumpy mashed potatoes, seriously...:-) According to my mom, there is a process for making creamy mashers and if you don't get the first several steps right you are doomed for failure. Well, mom would be quite disappointed if she knew that my mashed potatoes were a little lumpy because I do not own a food mill, potato ricer, or even a potato masher, and I had to use a small pastry cutter to mash five pounds of potatoes! Quite the chore...Of course, the flavor of the potatoes made up for the texture and I actually prefer a little texture anyways. If mashed potatoes are too smooth it kind of reminds me of a school cafeteria and the scoops of potatoes they used to dish out...not a good memory! Always use russet potatoes, never boiling potatoes, unless of course you are making "smashed potatoes". Cut potatoes in even chunks so that they cook evenly. Always start the potatoes in plenty of cold, salted water. Never overcook the potatoes or they will become waterlogged. You want them to be cooked through, but still be firm. I cooked my potatoes about 25 minutes. Test after 15-20 minutes of cooking time. Drain potatoes really well and run through a food mill or potato ricer while still hot. Once potatoes are completely smooth, stir in room temperature butter. Next, add heated garlic cream mixture and then add the remaining cream a little at a time until you reach the desired consistency. Stir in herbs and salt and pepper to taste. Serve immediately, or keep potatoes warm until ready to use by tenting with aluminum foil and placing over a pot of barely simmering water. Soak 1 cup of cashews for a minimum of four hours or overnight in filtered water. Drain water and place cashews in a blender, along with 3 cups filtered water and blend until smooth, about four minutes on high. If you have a high-speed blender such as a Vita-Mix then you don't need to strain; otherwise, strain and set aside. You will need about 2 and 1/4 cups for the recipe. 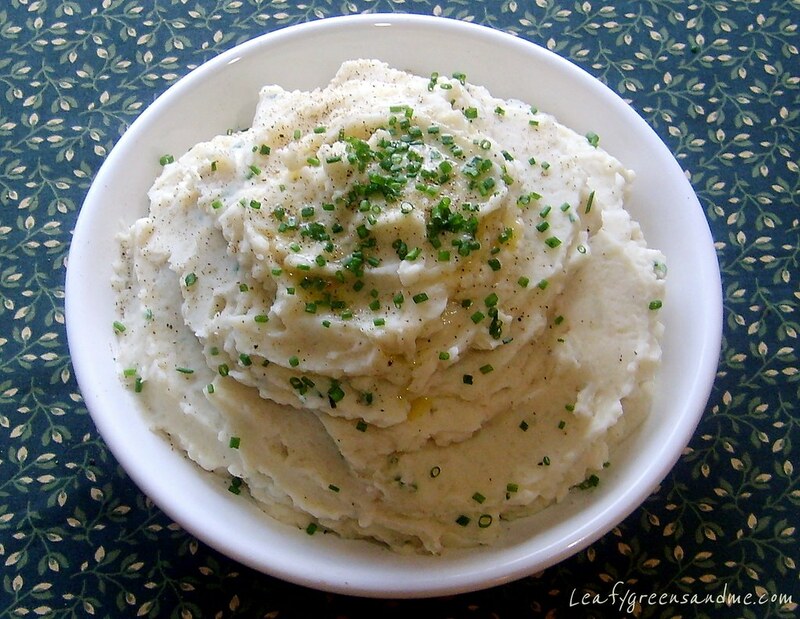 Note: Cashew cream/milk works the best for mashed potatoes because of the high-fat content. You can also use a full-fat plain soy, but I find that it gives a strange taste and color to the potatoes. I do not recommend using almond or rice milk as a substitute. Cut the tops off of two large heads of garlic and drizzle with olive oil, salt and pepper. Wrap in aluminum foil and bake for one hour until soft. Remove from oven and let cool before squeezing out tender cloves. Place cloves in a blender with 1 cup of cashew cream/milk and blend until smooth. Remove from blender and set aside. I made these this weekend and they are the best darn mashed potatoes I think I've ever had! Plan to post about it on my blog this week! Thanks for a great recipe! I am trying these for sure! Chives for green onions? What do you think? I'm gland that you really liked the mashed potatoes--my husband loved them as well and I will definitely be serving them for Thanksgiving. Thanks for sharing your experience on your blog! I would not substitute green onions or scallions for the chives. Green onions will overpower the other flavors. The chives have a subtle onion-garlic flavor and work well with the roasted garlic. So definitely use the chives and let me know how you like them!